The J.D. Power Initial Quality StudySM (IQS), conducted annually for more than 30 years, serves as an automotive industry benchmark study of new-vehicle quality after 90 days of ownership. People who bought new cars, trucks, SUVs, and van share with J.D. Power what went right and what went wrong during those first three months with their new vehicles. Based on this information, J.D. Power creates Power Circle Ratings. These ratings summarize the findings in the study, representing the data in a simple, visually communicative way. When researching vehicles, consumers can use these ratings to make smarter purchase decisions. This buyer’s guide contains the top-rated 2018 Luxury SUVs for Initial Quality, each with a base price under $50,000. Every model on this list earned a Power Circle Rating of 4 or 5 out of a possible 5 for initial quality during the first 90 days of ownership. Serving as the entry point to its X-badged line of Sports Activity Vehicles, the BMW X1 is based on a front-drive platform shared with the Mini Countryman and new-for-2018 BMW X2. All-wheel drive is optional, delivering power from the turbocharged 4-cylinder to all four wheels. For 2018, BMW adds standard equipment, adjusts option packages, and enhances the X1’s technology offerings. The 2018 BMW X1 receives an Initial Quality Power Circle Rating of 5 out of 5 and receives a quality award in the Small Premium SUV segment, in a tie with the Mercedes-Benz GLA. A 5-passenger midsize crossover SUV, the Cadillac XT5 features a 310-horsepower, 3.6-liter V8 engine and front- or all-wheel drive. Standard, Luxury, Premium Luxury, and Platinum trims are available, and because the XT5 was brand-new for 2017, replacing the old SRX model, Cadillac makes few changes for 2018. The 2018 Cadillac XT5 receives an Initial Quality Power Circle Rating of 4 out of 5. Did you know that Infiniti offered a hybrid version of the QX60? It’s canceled for 2018, leaving a 3.5-liter V6 engine, a continuously variable transmission, and front-wheel or all-wheel drive. Option packages add luxury, convenience and technology features. The 2018 Infiniti QX60 receives an Initial Quality Power Circle Rating of 4 out of 5. After loyal owners requested one for years, Lexus finally installs a third-row seat in the popular RX. Called the RX L, this new 7-passenger version is slightly longer in order to accommodate extra people. Otherwise, the lineup continues with a V6 engine or a hybrid drivetrain, and with front-wheel or all-wheel drive. Lexus Enform services is now standard for 10 years, too. The 2018 Lexus RX receives an Initial Quality Power Circle Rating of 5 out of 5. Based on the Ford Escape, the Lincoln MKC has its own styling and an exclusive engine upgrade. A turbocharged 2.0-liter 4-cylinder is standard, paired with front-wheel or all-wheel drive. Upgrade from base Premiere to Select or Reserve trim, and a turbocharged 2.3-liter 4-cylinder engine is available with AWD. Lincoln also offers the MKC with plush Black Label trim. The 2018 Lincoln MKC receives an Initial Quality Power Circle Rating of 5 out of 5 and receives a quality award in the Compact Premium SUV segment. The MKX is Lincoln’s 5-passenger midsize crossover SUV. The name disappears next year, replaced by Nautilus at the same time the vehicle undergoes a significant freshening. In the meantime, the 2018 MKX is essentially unchanged, continuing to offer a V6 or twin-turbocharged V6 and front-wheel or all-wheel drive. Premiere, Select, Reserve, and Black Label trim levels are available. The 2018 Lincoln MKX receives an Initial Quality Power Circle Rating of 4 out of 5. Sharing its front-drive platform with the Mercedes-Benz CLA, the GLA is a small crossover SUV with optional all-wheel drive. A turbocharged 4-cylinder provides power, making extra in the performance-tuned AMG GLA43 version. For 2018, the GLA received minor exterior and interior design changes, an improved infotainment system, a new off-road suspension for the GLA 250 models, and an updated transmission for AMG GLA43 models. 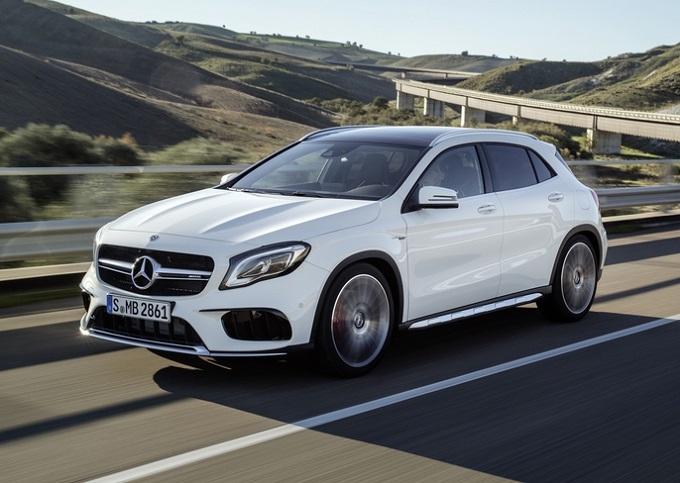 The 2018 Mercedes-Benz GLA receives an Initial Quality Power Circle Rating of 5 out of 5 and receives a quality award in the Small Premium SUV segment, in a tie with the BMW X1.